Defying family and social pressure, Nettie Brady bucks 1920s convention with her dream of becoming a rodeo star. That means competing with men, and cowgirls who ride the rodeo circuit are considered "loose women". Addicted to the thrill of pitting her strength and wits against a half-ton steer in a rodeo, Nettie exchanges skirts for pants, rides with her brothers on their Montana ranch, and competes in neighborhood rodeos. Broken bones, killer influenza, flash floods, and family hardship team up to keep Nettie from her dreams. Then she meets a young neighbor cowboy who rides broncs and raises rodeo stock. Will this be Nettie's ticket to freedom and happiness? Will her rodeo dreams come true? Put simply, Cowgirl Dreams is a solidly written, entertaining western. Nettie is a person that I think so many little girls can relate to. She is strong but stubborn, brave yet a bit reckless, and enjoyable to experience from the beginning to the end. It was fun to read about a tomboyish young girl growing up and coming to terms with her family, her dreams, and true love. The writing of the book felt smooth, and the dialogue was great. The author successfully incorporated the 1920s country vernacular while still maintaining it's relevance for the contemporary reader. This book would be especially great for adolescent girls to read and find inspiration, especially the girls out there who feel like they don't fit in to the mold people are trying to squish them. Now, this book was perfect, while Cowgirl Dreams was really a joy to read, I was not left thinking about it for very long after I finished, and for that reason, I am rating it a 3, Find a Used Book Store. It is worth spending money on, but not necessarily the asking price, it's not a life changer, but a good read. Heidi M. Thomas: I really have always thought of myself as a writer. “I write, therefore I am a writer,” to paraphrase a famous line. HMT: Getting out in nature often provides me with a mind-cleansing experience that leads me back to writing when I’ve hit a dry spot. Sunshine helps too. TBB: What inspired you to write your first book? HMT: The first book I wrote will actually be the fourth in my planned series. That one was based on my mother who immigrated from Germany to rural eastern Montana after WWII. 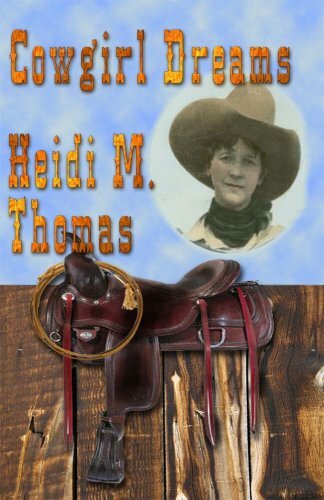 HMT: Nettie riding steers and competing in rodeos at a young age, meeting Jake and their romance, the geographic area, their homestead and the hardships of living are all based on truth. I named several “real” Montana cowgirls like Marie Gibson, who was a friend of my grandmother’s. I don’t know that my great-grandmother opposed my grandmother’s rodeo riding, but I needed more conflict and that seemed natural. HMT: I would love to be able to thank each one personally for reading my book, I just hope that my book is enjoyable and evokes some kind of memory or emotion they can identify with. If you are interested in purchasing this book, please consider supporting The Book Buff by purchasing from the following Amazon link. Thank you! I read Cowgirl Dreams and felt it a worthy read. Thomas' description of life in that era seemed very realistic. I thought her characters came to life and I could empathize with Nettie, the girl whose dream became a reality. Your newest follower, and thanks for the advice! Thank you, Kate, for the very nice, honest review. As I wrote to you personally, as an author I dislike recommending buying used books (no royalties), but as a reader I do understand and often do so myself. I want people to read my book, no matter the format, and hope you all will become fans and purchase my next book, Follow the Dream, due out this summer or fall!